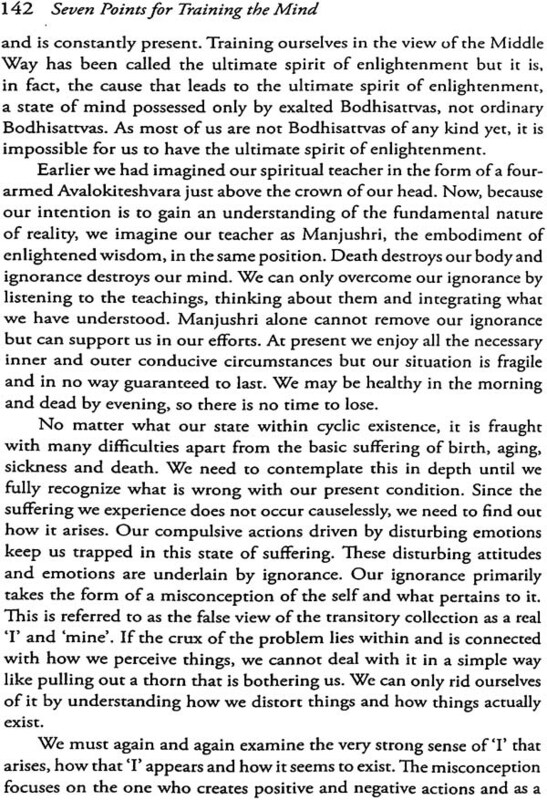 Of the many mind training (lojong) textsthat exist, Geshe Chekawa’s Seven Points for Training the Mind is one of the most complete. The mind training tradition that developed in Tibet has its source in the words of the great Indian masters Nagarjuna and Shatideva. 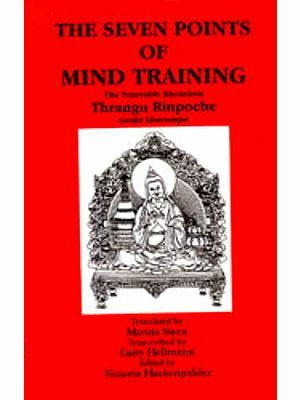 This particular texts expands on the Tibetan master Geshe Langritangpa’s Eight Verses for Training the Mind. Although it was written in the twelth century. 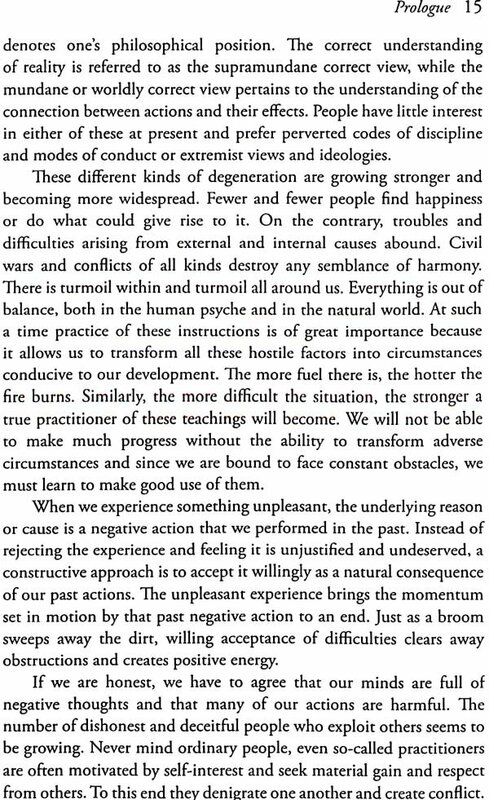 Geshe Chekawa’s advice is as relevant today as it was then because human nature has remained much the same. The text provides us with the means to transform our attitudes, gain increased mental control, develop a deeper understanding of reality and greater love, compassion and kindness towards others. Remarkably, the commitments and precepts set out by the author act as pertinent guidelines for a less stressful and more harmonious life in today’s world. Geshe Sonam Rinchen (1933-2013) was born in Tibet. He studied at Sera Je Monastery and in 1980 received the Geshe Lharampa degree. He taught daily classes in Buddhist philosophy and practice at the Library of Tibetan Works & Archives from 1978 until 2012 as well as making a number of teachings tours abroad during the winter vacations. Ruth Sonam was born and grew up in Ireland and graduated from Oxford University with an M.A. in Modern Language. She began studying with Geshe Sonam Rinche in 1978 and acted as his interpreter fro 1983. Together they published ten books. Je Tsongkapa, the great Tibetan scholar and practitioner, reminds is wha a precious opportunity it is to meet with the Bhddha’s teachings, especially those of the Great Vehicle and particularly with teachings as rare and special as those belonging to the genre known as lojong in Tibetan, which are succinct instructions for training mind. Our good fortune should make us feel a sense of joy and a strong wish to train our mind in order to fulfil our significant potential and become of true benefit to other. We are educated people with the ability to use words well and so we are good at talking but these teachings are about quietly taking action to bring about a radical and lasting transformation in our way of thinking. When we are riding a bicycle or driving, we constantly need to be aware of what is going on around us. We must develop that kind of vigilance in relation to our mind. If we manage to break the habitual negative patterns of thoughts that result in suffering, we can replaced them by thought and feelings that will bring us and others happiness. Appreciating and valuing the spirit of enlightenment, the altruistic intention to become enlightened for the sake of all living beings, and admiring those who have it is not enough. We need to develop it ourselves and there are two techniques to help us do so. One method relies on the seven-point cause an effect instructions according to which we begin by recognizing all living beings as our mothers, recalling their kindness and, out of gratitude, wanting to repay that kindness. The other method consists of equalizing and exchanging self and others, achieved though contemplating the faults of selfishness and the great benefits of cherishing others. The second method is said to produce a stronger resolve and is the one employed here. This method was kept quite secret by the early masters of the Kadampa tradition in Tibet. The mind training texts are based on the words of the great Indian Bodhisattva Shantideva in his Way of the Bodhisattva. These words refer to the secret practice of equalizing and exchanging self and other that is central to the mind training texts, which also incorporate the practice of giving and talking. 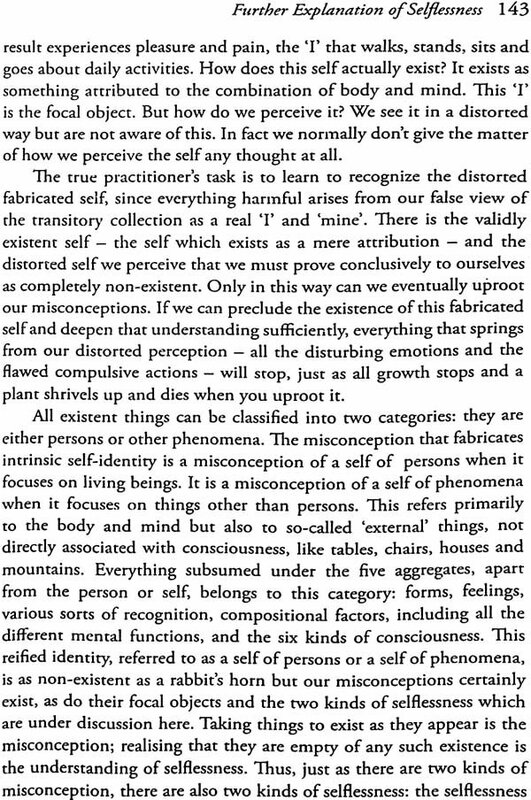 These practices are referred to as secret because most people find them overwhelming and they were, therefore, kept from those who lacked and intelligence and courage to practice properly, they lead to a radical inner transformation of which there are no instantly recognizable outward signs to distinguish one from other members of the society in which one lives. They are private, internal practices that do not involve external ritual. If done secretly, in this way, the practitioner will meet with fewer interferences. There are many mind training texts but the Seven Points for Training the Mind is renowned as one of the most complete. The particular explanation of Geshe Chekawa’s text given here follow the commentaries by the Tibetan masters Ngulchu Dharnabhadra and Kachen Yeshe Gyeltsen. In the monastic university of Nalanda, it was customary at the beginning of a teaching to emphasize the purity of the author’s writing, the purity of the teaching and the prerequisite purity of the student’s attitude. This refer to the author’s ability to communicate in a clear, orderly and coherent way; to the fact that the teaching has not become corrupted and to the unbiased, intelligent and enthusiastic approach the student needs to foster. In the monastic university of Vikramashila, the first three topics discussed were the special qualities of the author, the preeminent qualities of the approach that will be followed here. The Buddha’s teachings have been transmitted in a living unbroken continuity. The lineage of teachings on the extensive deeds of Bodhisattvas was passed from Maitreya to Asanga and lays emphasis on the skilful means taught by the Buddha. The lineage of the profound view, coming from Manjushri through Nagarjuna, mainly emphasizes the wisdom aspect of the Buddha’s teaching. The inspiring practice lineage, from the point of view of sutra, starts with the Buddha Shakyamuni and down through Manjushri and Shantideva. The eleventh century master Atisha received teachings associated with all three lineages. At a certain point, when he was wondering to which practice he should give precedence, he received a number of signs. While circumambulating the great stupa in Bodhgaya, he had a vision of two women in the sky before him. The younger prostrated herself to the older and asked her what practices were most important for the attainment of enlightenment. The older reply that love, compassion and the spirit of enlightenment were the most crucial and explained much to the younger one about these things. Atisha listened to all her instructions, which were given from the standpoint of the Secret Mantra Vehicle, and he retained all that had been said. To this day people make offerings to several statues of Tara at the great stupa in Bodhgaya, claiming that the women Atisha saw were emanations of Tara and that one Tara advised him about how to develop the spirit of enlightenment, while another later encouraged him to make the journey to Tibet. After some time, when he entered the temple inside the stupa, Atisha observed the smaller statues making obeisance to the larger ones. They asked the same question and received the same reply. Again Atisha took in everything he heard. This time the instructions were given from the standpoint of the Perfection Vehicle. 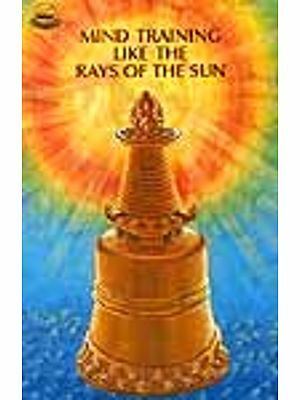 Since it was reputed that Dharmakirti of Suvarnadvipa held the most complete instructions on how to develop the spirit of enlightenment. Atisha resolved to visit this great master. With one hundred and twenty-five students he set out for Indonesia on board a merchant ship. The journey took thirteen months during which they faced many dangers. At one point a leviathan rose up in front of the ship and blocked its passage. Then thunderbolts rained down on the vessel and great storms threw it off course. After three weeks of such calamities, Atisha’s companions on board begged him to put a stop to these terrifying events. Finally, through the force of his love and compassion and with the help of Yamantaka, he succeeded in pacifying the demonic forces hostile to his enterprise of seeking instruction on the spirit of enlightenment and to his wish that the Buddha’s teaching should spread more widely. When he requested instruction from the master of the Golden Isles, Dharmakirti asked him if he felt he had the capacity to develop great love, great compassion and the altruistic intention to become enlightened for the sake of other and whether he was prepared to remain with him for a long time. Atisha answered that he was prepared to do whatever was needed and that he would remain for as long as was necessary. Atisha stayed with his master for twelve years and so close was their relationship that at night their pillows touched. Atisha received all the teaching on the spirit of enlightenment that the master could give and succeeded in putting them into practice. As a token of his affection and as a prediction that Atisha would become a great holder of the teachings, the master gave him a treasured gold statue of Buddha that has always been close to him since his childhood. His prediction was fulfilled, first in India and then in Tibet, where Atisha’s presence was to have a profound effect on the course of Buddism. Atisha studied with more than one hundred and fifty spiritual masters, of whom at least twelve were so renowned that they were often compared to the sun and moon. But whenever Dharmakirti of Suvarnadvipa’s name was mentioned, the tears would come to his eyes and he would rise and place his hands together in a gesture of profound respect. Each year Atisha would commemorate the passing away of this master. When asked why he unfailingly did all this, he answered that there was no difference between that qualities that his spiritual teachers possessed, but that of them all the master of the Golden Isles had been kindest to him. “Any goodness I possess id due to him.” This teaches us two things: the master whose advice has had the greatest impact on us is the one who has been kindest to us and to whom we should feel most grateful. It also reminds us of the importance of kind-heartedness, the source of all happiness and well-being in the world. In Borobudur on the island of java in Indonesia we can still see evidence of great Buddhist civilization. Many years ago I met a man who has been charge of a UNESCO team that was restoring the site. The work had been just finished and he spoke out beginning the restoration of Lumbini, where the Buddha was born. Not so long after that I heard that bombs had destroyed the work that had been done in Borobudur and the task of restoration had to begin all over again. Some people have the merit to do such work, while others are unfortunate enough to destroy holy places. These days there are group of people who wish to protect place in our world that are considered holy and sacred in different spiritual traditions. I think this is important. When Atisha left Vikramashila in India and travelled to Tibet, he stopped for some time in Ngari, where he met Dromton Gyelway Jungnay who was to become his foremost disciple. It is to him that Atisha passed on the instructions he had received from his Indonesian master. Atisha’s remain were enshrined in Nyetang after his death. In recent time they were secretly taken from there to China. Eventually they were brought to was than East Pakistan and is now Bangladesh because this area was said to have been his birth place and was ruled by Atisha’s father. Dromtonpa became the first of the great Kadampa master. Publicly he gave teaching on the stages of the path to enlightenment but passed on these special instructions to only a view of his most capable disciples, such a Geshe Potowa, who remaind with him for five or six years. Geshe Potowa drew on six great texts, revered in the Kadampa tradition, to gain certainty about how to develop the spirit of enlightenment. These texts were Shantideva’s Compendium of Traning and The way of the Bodhisattva; Asang’s Bodhisattva stages; Maitreya’s Ornament for the Mahayana Sutras; Stories of the Buddha’s Lives by Aryashura and the collection, a compendium of short sutra statements. Geshe Potowa then transmitted the teachings to Geshe Langritangpa and Geshe shaeawa. It was from Geshe Sharawa that Geshe Chekawa received them. Geshe Chekawa came from a family that had for generations produced many prominent Nyingma practitioners of tantra. He was already a great scholar of sutra and tantra and had gained understanding of hundreds of text when he came cross Geshe Langritangpa’s Eight Verses for Training the Mind. He had long felt that there must be some practice which whould speed him towards enlightenment and when he read Geshe Langritangpa words: ‘May I accept defeat and offer the victory to them’ , he knew that he had found the key. His interest in the Kadampa tradition was aroused and he travelled to central Tibet to find Geshe Langritangpa. When he got there, Geshe Langritangpa was no longer alive and so he went to see Geshe Shaeawa, who was said to possess the lineage of these instructions. He arrived in Penpo, an area where many of The Kadampa master lived, while Geshe Sharawa was teaching the fourth century Indian master Asanga’s Hearer Stages. He remained there and listened to Geshe Sharawa for a year but not ones did he hear him mention the practices in which he was most interested. He found some of what he heard helpful, while other parts made no particular impression on him, and all the time he wondered whether Geshe Sharawa really did possess the lineage of instructions for training the mind, which he was seeking. Geshe Chekawa decided that if he did not, he would have and go elsewhere to search for them. With reverence Geshe Chekawa answered that he had some across Geshe Langritangpa’s Eight Verses and that while travelling from place to place, when he couldn’t find anywhere to sleep or when people were rude and disparaged him, he had found Geshe Langritangpa’s instructions of great use. He was anxious to know whether this teaching would lead him more quickly to enlightenment. 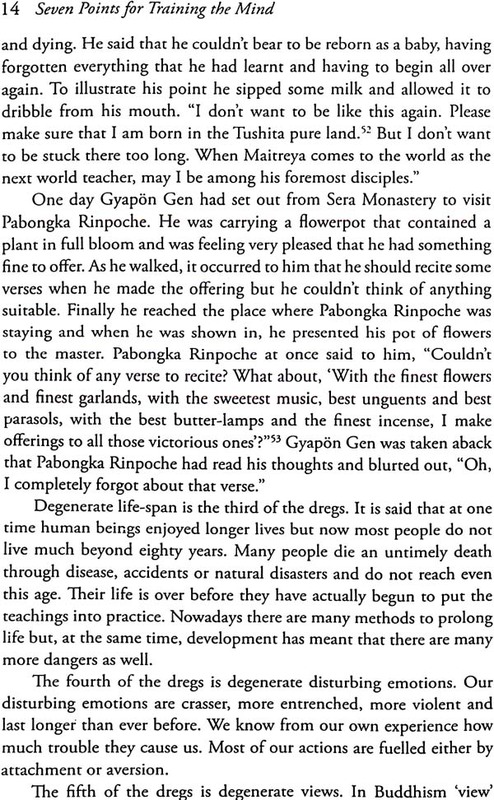 Geshe Sharawa replied that whether or not it had helped Chekawa personally, it was an indisputable fact that one could never hope to attain enlightenment without developing the attitude described by Geshe Langritangpa. And my virtue ripen on them. Shawara explained that talking on the suffering of others, allowing it to ripen on oneself and giving away one’s happiness were the quintessence of the training that Geshe Langritangpa had described. Chekawa then begged Sharawa to give him the precious instructions on how to develop this ability and Sharawa agreed, provided that Chekawa was prepared to stay with for a sufficient period of time. He remained with Sharawa for fourteen years, received the complete teaching and put it into practice with such success that he was able to develop the spirit of enlightenment in a powerful way. Je Tsongkhapa later paid homage to Chekawa, referring to him as the lord of the altruistic intention. At the time in Tibet there were many lepers. 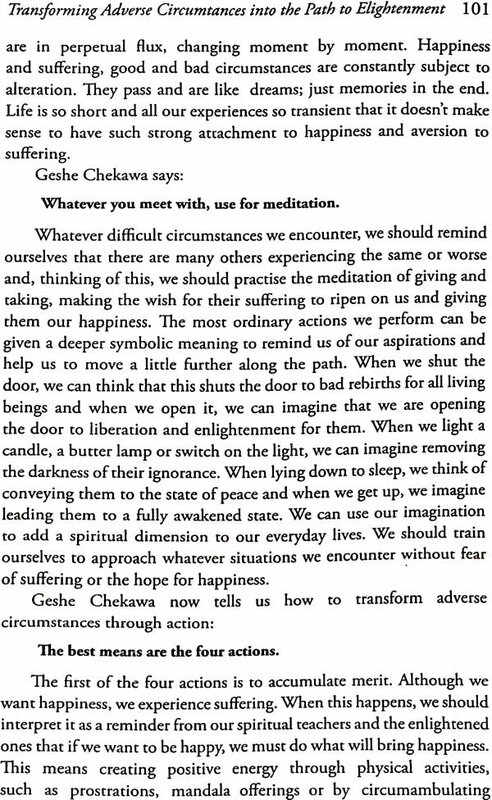 Geshe Chekawa gave this teaching to a group of lepers who cured themselves by practicing it. Because of this the teaching later became known as the ‘leper practice’. Nowadays there are many serious illnesses and those suffering from them might also derive benefit from practicing it. 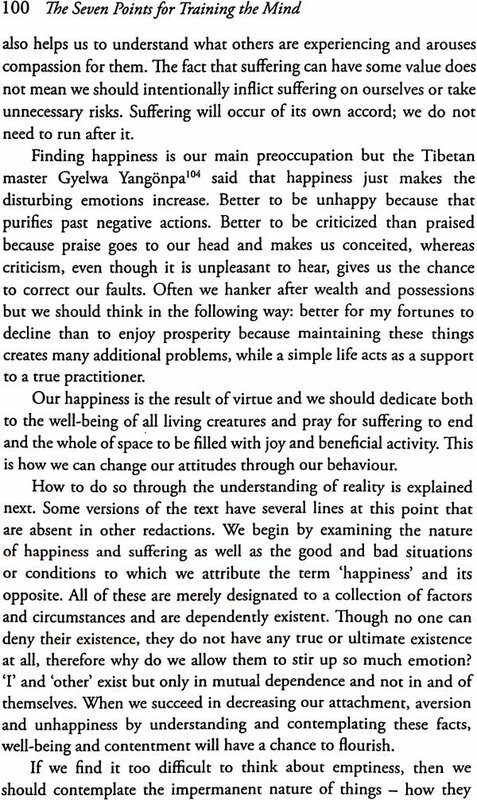 Recognisting its great efficacy, Geshe Chekawa thought it should be more widely disseminated and therefore wrote it down.